Home / Christian News / Inspiration / There Is A Place Of Safety For The Philadelphians - Where? There Is A Place Of Safety For The Philadelphians - Where? Are some of God's people actually going to flee right before the tribulation? According to Jesus the answer is yes. ''And pray that your flight may not be in winter or on the Sabbath. For then there will be great tribulation, such as has not been since the beginning of the world until this time, no nor ever shall be" (Matthew 24:20-21, NKJV throughout, unless otherwise indicated). Do all know that those who need to be warned include the members of the Churches of God (COGs)? The purpose of this article is to explain some of the reasons why Petra seems to be a more logical choice to be the "place of safety" for the Philadelphians. But the woman was given two wings of a great eagle, that she might fly into the wilderness to her place, where she is nourished for a time and times and half a time, from the presence of the serpent. So the serpent spewed water out of his mouth like a flood after the woman, that he might cause her to be carried away by the flood. But the earth helped the woman, and the earth opened its mouth and swallowed up the flood which the dragon had spewed out of his mouth. And the dragon was enraged with the woman, and he went to make war with the rest of her offspring, who keep the commandments of God, and have the testimony of Jesus Christ (vv. 14-17). The above shows that the church (symbolized by a woman) has to "fly into the wilderness to her place". Being in heaven with Jesus is not the same as being in any wilderness--hence this is not some type of "rapture" as many Protestants believe in. Also notice that the church "is nourished for a time and times and half a time, from the presence of the serpent." Hence, this is how Jesus is intending to keep His Philadelphia Church "from the hour of trial which shall come upon the whole world" (3:10). Notice also that since a flood of water is used to try to destroy the church, but is helped by the earth, that the church is NOT in heaven, but on the earth (speaking of water coming out of the mouth of the serpent--that is what the last page of the famed Dresden Codex of the Mayan 2012 prophecies shows, though the flood does not seem there to be directed against a church--to view that photo, please see the article End of Mayan Calendar 2012--Might 2012 Mean Something?). Carefully notice that just keeping the commandments of God and having the testimony of Jesus Christ is not enough to insure that one will go "into the wilderness", be "nourished", and protected "from the presence of the serpent". The dragon, through the Beast power, will “make war” with those who do not go. For "the saints shall given to his hand for a time and times and half a time" (Daniel 7:25). But take heed to yourselves, lest your hearts be weighed down with carousing, drunkenness, and cares of this life, and that Day come on you unexpectedly. For it will come as a snare on all those who dwell on the face of the whole earth. Watch therefore, and pray always that you may be counted worthy to escape all these things that will come to pass, and to stand before the Son of Man" (Luke 21:34-36). Because you have kept my command to persevere, I also will keep you from the hour of trial which shall come upon the whole world, to test those who dwell on the earth. Behold I come quickly! Hold fast what you have, that no one may take your crown. The Philadelphians are the only ones that God promises to keep “from the hour of trial that comes upon the whole world”. Regarding the letter to the angel of the church of the Laodiceans shows they walk a different path: "As many as I love, I rebuke and chasten. Therefore be zealous and repent" (v.19). I know your works. See I have set before you an open door, and no one can shut it; for you have have a little strength, kept My word, and have not denied My name (v. 8). ...that you are neither cold nor hot. I could wish you were cold or hot. So then, because you are lukewarm, and neither cold nor hot, I will spew you out of my mouth. Because you say, 'I am rich, have become wealthy, and have need of nothing'--and do not know that you are wretched, miserable, poor, blind, and naked--I counsel you to buy from Me gold refined in the fire, that you may be rich; and white garments, that you may be clothed, that the shame of your nakedness may not be revealed; and anoint your eyes with eye salve, that you may see (vv.15-18). The Philadelphians are promised to be kept from the hour of trial because they kept God's "command to persevere" or as the AV says "kept the word of my patience" (v. 10). If the Philadelphia era of the Church existed while Herbert W. Armstrong was alive (as he believed it was), could this possibly mean that the remaining remnant of the Philadelphia era are the ones who still believe, teach, and practice what Jude referred to as "the faith which was once for all delivered to the saints" (Jude 3)? (Click here for the article What is a True Philadelphian?) Would this not include the 18 truths that HWA restored to the Church of God without adding extrabiblical requirements? Would not this Church also have the same priority of proclaiming the Gospel of the Kingdom to the world? Remember Jesus said, "Blessed is that servant whom his master will find so doing when he comes" (Luke 12:43). I perhaps should add that groups and independents that misunderstand prophecy (such as those concerning The King of the South and Zephaniah 2) will probably rationalize themselves away from fleeing when it will be time to go--and they will be refined (it is also possible that God may somehow use some of them to assist The Two Witnesses). In Revelation 3, we read of two final phases of the history of the Church of God. The Church of Philadelphia was to be characterized by a zeal to do the Work. God promised to set before them an 'open door' as well as to protect them from the future Great Tribulation. However, there is a final seventh stage of the Church described, as the Church at Laodicea. This church was to be described by spiritual lukewarmness and lethargy. It is described as a worldly church, and certainly one which fit in with the spirit of these permissive, modern times...Some of God's people have been overwhelmed by the cares and problems of this life or by personal problems and have dropped by the wayside. Others have been deceived by false prophets and have gone into apostasy. Still others have become so lethargic and softened by comfort that they have lost their vision and merely wish to maintain local churches, no longer caring about doing the Work...Will you be one whom God uses to finish his end-time Work? Do you have that true Philadelphian spirit that reaches out to the whole world in genuine love and concern to share God's message of Truth and hope? Do you consider it important that the House of Israel be warned of the impending time of Jacob's trouble? Looking at the meanings of the names of the different churches may help reveal some characteristics of each. According to Strong's Greek concordance, Philadelphia means "fraternal affection", "brotherly love", "love of the brethren", "fond of the brethren". Also according to Strong's, Laodicea is a combination of two words, laos which it defines as "people" and dike, which is defined by Strong's as "right", "judgment", "punish", and "vengeance". Smith's Bible Dictionary defines Laodicea to mean "justice of the people". Might the term Laodicean convey that the predominant characteristic of this Church is that people rule, the people judge, or, in fact that the people are judgmental? I personally feel that the term Laodicea conveys a difference in governance and that most Laodiceans have rejected the restored truth about governance (which results in a lukewarm attitude about doing the work). What Happens to Those Not in a Place of Protection? The tongue of the infant clings To the roof of its mouth for thirst; The young children ask for bread, But no one breaks it for them...Those slain by the sword are better off Than those who die by hunger; For these pine away, Stricken for lack of the fruit of the field. The hands of the compassionate women Have cooked their own children; They became food for them In the destruction of the daughter of my people...Our pursuers were swifter Than the eagles of the heavens. They pursued us on the mountains And lay in wait for us in the wilderness (Lamentations 4:4-19). For then there will be great tribulation, such as has not been since the beginning of the world until this time, no nor ever shall be (Matthew 24:21). Thus, we can look at the most horrifying events that have happened in the past and yet realize that the coming Tribulation will be worse. Since a portion of God's people have fallen in the past (I Corinthians 10:1-11), many things were recorded "for our admonition, on whom the ends of the ages have come. Therefore let him who thinks he stand take heed lest he fall" (I Corinthians 10:11-12). Matthew 24:22 states, "And unless those days were shortened, no flesh would be saved" yet, though the situation appears bleak--almost hopeless--notice the conclusion of the verse, "but for the elect's sake those days will be shortened". Similarly in Jeremiah 30:7 it says, "Alas! For that day is great, So that none is like it; And it is the time of Jacob's trouble, But he shall be saved out of it". Yes, God will deliver some of His Spirit-begotten children from the the physical terror of the Tribulation. He'll deliver the remnant of the Philadelphians. For Jesus says, "But not a hair of your head shall be lost" (Luke 21:18). The expression "At that time" is the same Hebrew expression that is in Daniel 11:35. This suggests that Michael will likely provide protection to God's people when they flee (more on prophetic sequence in Daniel can be found in the article Who is the King of the North?). Are most of God's people going to go to a place of protection or most going to go through the Tribulation? The Bible seems to give us clues. The three places where the NKJ Bible uses the expression "time and times and half a time" are Revelation 12:14, Daniel 7:25, and Daniel 12:7. They seem to be referring to the same time period. Daniel 12:7 states "a time, times, and half a time, and when the power of the holy people has been completely shattered, all these things shall be finished". This suggests that nearly all of the "holy people" are affected. The ten horns are ten kings Who shall arise from this kingdom. And another shall rise after them; He shall be different from the first ones, And shall subdue three kings. He shall speak pompous words against the Most High, Shall persecute the saints of the Most High, And shall intend to change times and law. Then the saints shall be given into his hand For a time and times and half a time. Note that the saints will be persecuted before they are "given into his hand"; perhaps that means all of God's people will be persecuted before the period "time and times and half a time" begins. The expressions "completely shattered" and "the saints shall be given into his hand" seem to suggest that most of the saints will be in the tribulation. We know this cannot mean all because the book of Revelation says the Philadelphians will be kept from the hour of trial (3:10)--protected "from the presence of the serpent" (cf. 12:14). God will in some way separate Christians living in when these terrible calamities finally come to be. Some will be protected from the Tribulation--many, however, will not be! (3:16). And some of those of understanding shall fall, to refine them, purge them, and make them white, until the time of the end; because it is still for the appointed time. And he said, 'Go your way Daniel, for the words are closed up and sealed til the time of the end. Many shall be purified and made white, and refined, but the wicked shall do wickedly; and none of the wicked shall understand, but the wise shall understand. Who is counseled to by gold that has been refined? Who is warned that they will be rebuked and chastened? The Laodiceans (Revelation 3:18,19). Even when Babylon the great is clearly evident on the world scene, it seems that God's people still need to be warned, "And I heard another voice from heaven saying, 'Come out of her my people, lest you share in her sins, and lest you receive of her plagues'" (18:4). Some, sadly, probably will "receive of her plagues" (or that warning would probably have not been necessary). And let us go into the fortified cities.' 6 Set up the standard toward Zion. The above passage is suggesting that there will be a time that will come that those in Judea and Jerusalem will have to flee into a place of defense. This is consistent with what Jesus told His followers to do in Matthew 24 :15-16 when they see the abomination of desolation spoken of by Daniel (which happens right after the sacrifices, which have not yet started, have been stopped). And Jeremiah is basically warning that disaster will come from the north--in this case apparently the King of the North. And this may be because some of God's people have fled to Judea/Jerusalem in order to escape from some of the persecutions from this northern power (for more information on WHEN to flee, please see the article Who is the King of the North?). But when you see Jerusalem surrounded by armies, then know that its desolation is near. Then let those who are in Judea flee to the mountains, let those who are in the midst of her depart, and let not those who are in the country enter her. It thus appears that the place of safety is not in Jerusalem or Judea. Since the Bible also warns that God's people should flee Babylon and go out of Chaldea (Jeremiah 50:8;51:6,44-45; Zechariah 2:7; Revelation 18:4), Babylon and Chaldea apparently are not the places either. "Flee from the land of the north", says the LORD...Up Zion! Escape you that dwell with the daughter of Babylon (Zechariah 2:6,7). This not only suggests that the place may not be in a northern land, but that some Christians will have need to flee from the land of the north. Since the Bible seem to forecast near total destruction to the islands of the world (Revelation 6:12-14; 16:17-21), no island seems to be a likely place (more information can be found in the article Islands and Bible Prophecy). "He who walks righteously and speaks uprightly, He who despises the gain of oppressions, Who gestures with his hands, refusing bribes, Who stops his ears from hearing of bloodshed, And shuts his eyes from seeing evil: He will dwell on high; His place of defense will be the fortress of rocks; Bread will be given him, His water will be sure" (Isaiah 33:15-16)..."Assemble yourselves and come; Draw near together, You who have escaped from the nations" (Isaiah 45:20). Isaiah thus indicates this place will be a fortress of rocks for those that escape from the nations (note: the escaping from the nations suggests that groups with origins in CGI, such as ICG and CEM, are in error for teaching that God intends to protect people where they are). Gather yourselves together, yes gather together, O undesirable nation, Before the decree is issued, Or the day passes like chaff, Before the day of the LORD's fierce anger comes upon you, Before the day of the LORD's anger comes upon you! Seek the LORD, all you meek of the earth, who have upheld His justice. Seek righteousness, seek humility. It may be that you will be hidden in the day of the LORD's anger. The Hebrew words translated as Zephaniah means “Yahweh Hides” or “Yahweh Has Hidden” (Holy Bible: Vine’s Expository Reference Edition, p. 826). Notice that a decree is issued, apparently by a church leader. This would seem to happen after the gospel has been preached enough to the world as a witness (Matthew 24:14), Jewish sacrifices are stopped, and the abomination is set up (Daniel 9:27; 11:31) per Jesus' statements in Matthew 24:15-16. It remains my prayer that those who are Philadelphians and are scattered in groups will soon assemble together, before it is too late. What can you do? What action must you take? God tells us through the prophet Isaiah, “Seek the Lord, all you meek of the earth, who have upheld His justice. Seek righteousness, seek humility. It may be that you will be hidden in the day of the Lord’s anger” (Zephaniah 2:3). Yes, God will “hide” His people during the traumatic times ahead. But He expects us to be spiritually awake and watchful (Ames R. Armageddon and Beyond. LCG Booklet, 2007, p. 41). For Gaza will be forsaken, And Ashkelon desolate; They shall drive out Ashdod at noonday, and Ekron shall be uprooted. Woe to the inhabitants of the seacoast; The nation of the Cherethites! The word of the LORD is against you, O Canaan, the land of the Philistines (2:4-5). According to the commentary at Nelson's Study Bible on these verses Gaza, Ashkelon, Ashdod and Ekron are major cities of the Philistines and Cherethites is simply another name for Philistines. The land mentioned is currently primarily occupied by the Palestinians. Since people are to leave Judea, are not to go to Gaza, nor Canaan, nor to various places in the north, which direction can they go? Well, they cannot go west because the Mediterranean sea is in the way. This would seem to suggest going east, south, or possibly southeast (southwest would take one to Gaza). David wrote, "For in the time of trouble He shall hide me in His pavilion; In the secret place of His tabernacle He shall hide me; He shall set me high upon a rock" (Psalm 27:5). This may have a dual meaning. It may be referring to the tribulation and may also be referring to an interesting event in David's life. David was hiding in the woods from Saul (I Samuel 23:19), and "When Saul and his men went to seek him, they told David. Therefore he went down to the rock, and stayed in the wilderness of Maon...So David made haste to get away from Saul...so they called that place the Rock of Escape" (I Samuel 23:25,26,28). The word translated 'Rock' is Sela and the word translated as 'rock' are derivatives of the same word. Thus there was a Sela of Escape for David. Jesus taught, "And pray that your flight may not be in winter or on the Sabbath" (Matthew 24:20) which is consistent with Revelation 12:14 which clearly states that it is a place to go to, it is in the wilderness, and it is away from the presence of the serpent. The word translated as wilderness, is translated as desert in the NIV. This word is eremos, which Strong's defines as lonesome, waste, desert, desolate, solitary, wilderness. Thus, it is not protection in our own houses (as some have erroneously suggested), nor is it protection in a large city. It is somewhere in the wilderness. Situated within the harsh desert, Petra’s vitality was dependent upon an intricate hydraulic system fed by a perennial spring. This spring, the Ain Musa (Spring of Moses), is fabled to have been one of the places where Moses struck the rock with his staff to produce water for his wandering people after their flight from Egypt. Not surprisingly, the valley in which Petra is situated, the Wadi Musa (Valley of Moses) is also named after the Biblical patriarch. In addition, Moses’ brother Aaron is believed to be buried atop the Jebel Haroun (Mount of Aaron), a mountain just south of the city. 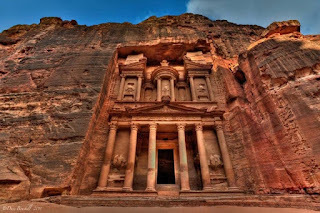 The belief that Aaron was buried so near Petra is especially noteworthy because it played an important role in Petra’s rediscovery by John Burckhardt (Petra: History, Myth, and Earthquakes; Standford.edu website). I should probably mention that some have alleged that the idea of Petra and the 'place of safety' were non-biblical inventions of Loma and/or Herbert W. Armstrong. This is not the case. The idea of the biblical cave-containing area of Sela (the area currently known as Petra) being a place of protection during the tribulation predates the Armstrongs mentioning it (probably by at least a century). The Church shall flee as to a desert in Antichrist's time, but not decay or be unknown, no not for so short a time. (p. 556). Furthermore, it is my opinion that the demons themselves know about this place (recall that even Satan quoted scripture to Christ, see Matthew 4). Anne Catherine Emmerich (October 1820): I saw the secret society undermining the great church and near them a horrible beast…concealing itself in a cave (Emmerich AC. The Life and Revelations of Anne Catherine Emmerich, Volume 2, p.290). And fly from those who linger in caves and are cloistered supporters of the Devil. Woe to them, woe to them who remain thus! They are the Devil's very viscera, and the advance guard of the son of perdition. Therefore, O you My beloved children, avoid them with all devotion and with all the strength of your souls and bodies. For the ancient serpent feeds and clothes them by his arts, and they worship him as God and trust in his false deceptions...Because they are afraid of My people, they do not openly resist these institutions of Mine, but in their hearts and their deeds they hold them as nothing. By devilish illusion, they pretend to have sanctity; but they are deceived by the Devil, for if he were to show himself to them openly they would understand him and flee him. By his arts he shows them things he pretends are good and holy, and thus deludes them. O woe to those who persevere in this death! But because the Devil knows he has only a short time for his error, he is not hastening to perfect infidelity in his members; you, you evil deceivers, who labor to subvert the Catholic faith. (Hildegard of Bingen. Scivias. Paulist Press, Mahwah (NJ), pp. 301-302). Since I believe that the mystic was demonically-influenced, she is actually warning against supporting the true Christians who will be protected who she is claiming are the "supporters of the Devil" (probably because they will oppose the Catholic Church). Since she calls them the advanced guard "of the son of perdition", she seems to be referring to a group of people who will be protected in caves just before Christ returns (I stated that because certain Catholic prophecies seem to refer to the returning Christ as the “antichrist”, who is also sometimes referred to as “the son of perdition”—for more on this, please read the article Do Certain Catholic Prophecies About Antichrist Warn Against Jesus?). Hence, I believe that the above demonically-inspired vision will be used to try to persuade people to be against those that are in caves (Jeremiah 48:28), who seem religious (Revelation 14:12), and are apparently miraculously fed (Isaiah 33:15-16). But, the above vision, does indicate that even the demons have known about a place of protection where some people will be miraculously fed, for quite some time. 8 The Lord GOD, who gathers the outcasts of Israel, says, "Yet I will gather to him Others besides those who are gathered to him." (Isaiah 56:8). Son, where is the cenote 566? All are drenched <with> its water 567. There is no gravel on its bottom; a bow is inserted over its entrance 568. <It is> the church. 568 A reference to the arched doorway of the church (José Hoíl J, Roys R. The Book of Chilam Balam of Chumayel. Roys Publisher, 1933. Reprint Forgotten Books, 1967, pp. 80, 233). Thus, the idea that the church would possibly be in a desert and/or cave area has existed for some time. Petra, by the way, seems to have something that could possibly be described as a somewhat arched doorway. There is no reason or necessity for you to submit to the Archbishop. When he comes, you go and hide yourselves in the forest. If you surrender yourselves, you shall follow Christ, when he shall come (José Hoíl J, Roys R. The Book of Chilam Balam of Chumayel , p. 77). Early Catholic writers such as Irenaeus in the 2nd century) (Irenaeus. Adversus haereses, Book V, Chapter 34, Verse 3. Excerpted from Ante-Nicene Fathers, Volume 1. Edited by Alexander Roberts & James Donaldson. American Edition, 1885. Online Edition Copyright © 2004 by K. Knight) and Hippolytus in the 3rd century (Hippolytus. On Christ and Antichrist, Chapter 61) also believed this, hence Hildegard is once again not even faithful to Catholic positions on prophetic matters. Antichrist shall reign for three years and a half only. We speak not from apocryphal books, but from Daniel ; for he says, And they shall be given into his hand until a time and times and half a time . A time is the one year in which his coming shall for a while have increase; and the times are the remaining two years of iniquity , making up the sum of the three years; and the half a time is the six months. And again in another place Daniel says the same thing, And he sware by Him that lives for ever that it shall be for a time , and times, and half a time. And some peradventure have referred what follows also to this; namely , a thousand two hundred and ninety days ; and this, Blessed is he that endures and comes to the thousand three hundred and five and thirty days . For this cause we must hide ourselves and flee (Cyril of Jerusalem. Catechetical Lecture 15. http://www.newadvent.org/fathers/310115.htm viewed 12/27/08). Thus, the idea of true Christians fleeing, being supported, and being away from the devil for 3 ½ years is consistent with both biblical and certain Catholic teachings. No one should rely on Hildegard’s false admonition. It may also be of interest to note that there are even some outside the COGs which believe in the concept of Petra as a place of protection. Some Protestants feel that Petra is the place that Jewish Christians who become converted during the tribulation will be protected in. Protestants, however, tend to have a problem reconciling the fact that the Book of Revelation refers to believers as those "who keep the commandments of God and have the testimony of Jesus Christ" (Revelation 12:17) and "the saints; here are those who keep the commandments of God and the faith of Jesus" (Revelation 14:12) with the fact that most Protestants believe that the ten commandments are done away--hence referring to those protected as "Jewish Christians", as opposed to recognizing that all real Christians keep the ten commandments, is how I have heard some try to rationalize that view. (Matthew 24:15-22), some believe that there will be a specific place in the desert that Israel can flee... (Walvoord JF. The Prophecy Knowledge Handbook. Victor Books, Wheaton (IL), 1990, p. 579). Some of the more recent books in the "Left Behind' series mention some 'believers' congregating in Petra at the end-time. Actually, the idea that Christians who seem to be Jewish (because they keep the seventh-day Sabbath) being protected in Petra is widely-held in Protestant circles that accept the idea of the Great Tribulation and the rapture. …the last half of the Tribulation…Many commentators suggest the Jews will flee to the ancient mountain fortress of Petra which is in the wilderness of Jordan…Satan’s final “war” will fall upon the believing Jews, the rest of her children, who keep the commandments of God and hold to the testimony of Jesus” (Revelation 12:17) (LaHaye T, Hindson E. The Popular Bible Prophecy Commentary. Harvest House, Eugene (OR), 2006, pp. 523-524). Those Jews in Israel who have come to know Yeshua personally during the first half of the tribulation will be responsive and it is to this believing remnant that Jesus makes His appeal. Who are they who must flee so urgently when the last days begin? Who dare not hesitate long enough even to go back into the house to pick up a wrap, but must immediately head for the hills? There is no need to wonder, for the Lord says plainly, "those who are in Judea" Now Judea is a geographical part of the land of Israel, ancient Palestine. It comprises the hill country surrounding the city of Jerusalem and includes the city as well. It is to the residents of Jerusalem and Judea that this warning is addressed. But here the Sabbath distinctly will be a restricting factor in the flight of these people. Here then will be a class of people who cannot be identified with the present day church They will be Jewish believers in Christ who will be converted after the removal of the church and before the time of the Great Tribulation. ...Most Bible scholars believe this godly remnant will find refuge in the ancient rock-hewn cliff city of Petra, and in the surrounding region in the land of that once belonged to the descendants of Esau, that is Edom (Southern Jordan). The remnant will survive there, protected by God, for three and a half years (Graff, Ron and Dolphin, Lambert. Thy Kingdom Come, Thy Will Be Done..., Chapter 11. Peninsula Bible Church, Palo Alto (CA), 1998). It should be pointed out that Ray Stedman is referring to Jesus' statement in Matthew 24:20 about the Sabbath. However, contrary to most Protestant teachings, Jesus did not state that this applied only to the Jews. In that verse, Jesus clearly was telling all believers to pray that their flight (possibly to Petra) not occur on the Sabbath or the winter. But it is true that those being protected keep the commandments of God and have the testimony of Jesus Christ as those that are Christians, but are not protected, also do (Revelation 12:17). The truth is that true Christians have always kept the Sabbath, thus Protestant exegesis of these passages has been tainted by their refusing to follow the practices of the early Christians in regards to the Sabbath and ten commandments. Basically these Protestant writers seem to think that only Jews could keep God’s commandments while at the same time believing in Jesus. That is bizarre, because if these are physical Jews and they do that, then this would mean that the two witnesses would be preaching that the commandments still need to be kept—something that most Protestant scholars disagree with. The truth is that those being protected, possibly in or near Petra, will be Philadelphia Church era Church of God Christians. Now, that the promises were not announced to the prophets and the fathers alone, but to the Churches united to these from the nations, whom also the Spirit terms "the islands" (both because they are established in the midst of turbulence, suffer the storm of blasphemies, exist as a harbour of safety to those in peril, and are the refuge of those who love the height [of heaven], and strive to avoid Bythus, that is, the depth of error) (Irenaeus. Adversus haereses, Book V, Chapter 34, Verse 3. Excerpted from Ante-Nicene Fathers, Volume 1. Edited by Alexander Roberts & James Donaldson. American Edition, 1885. Online Edition Copyright © 2004 by K. Knight). Thus, Irenaeus is endorsing the concept that the writings in the Old Testament about refuge and safety apply to Christians who avoid the depth of error. And the dragon, he says, saw and persecuted the woman which brought forth the man-child . And to the woman were given two wings of the great eagle, that she might fly into the wilderness, where she is nourished for a time , and times, and half a time , from the face of the serpent. That refers to the one thousand two hundred and threescore days (the half of the week) during which the tyrant is to reign and persecute the Church, which flees from city to city, and seeks conceal-meat in the wilderness among the mountains, possessed of no other defence than the two wings of the great eagle... (Hippolytus. On Christ and Antichrist, Chapter 61). Hence, he understood that the Church (and not just some later converted Jews) would end up in the wilderness near mountains. Again, they say that both in the time of persecution by Antichrist and in that of the aforesaid war carnal Christians will be so afflicted that, despairing, they will say, "If Christ were God, he would not permit Christians to suffer so much and such intense evil." Thus despairing, they will apostatize from the faith and die. But God will hide the elect spiritual individuals so that they cannot be found by Antichrist and his ministers. Then the church will be reduced to the same size as the primitive church when it was first founded (BERNARD GUI: INQUISITOR'S MANUAL, Chapter 5. Translated by David Burr, History Department, Virginia Tech, Blacksburg, VA. http://phi.kenyon.edu/Projects/Margin/inquisit.htm 04/09/07). Hence, it has long been understood that a small part of the true Church of God would be hidden by God, but that another part would not be. Furthermore, a Catholic mystic known as the "Blessed Elizabeth Canori-Mora" (early 19th century) proclaimed that after certain events, "the flock of Jesus" would be "gathered" "in a place of safety"(G. THE CHRISTIAN TRUMPET, OR, Previsions and Predictions about Impending General Calamities, The Universal Triumph of the Church, The Coming of Antichrist, The Last Judgment, and The End of the World. Compiled by PELLEGRINO [Gaudentius Rossi], A Missionary Priest with Superior's permission. Boston, THOS. B. NOONAND & CO., 1873, p.127). The idea of a place of safety has been discussed by many for centuries. Petra may very well be the site for God's protection of HIS PEOPLE---those who are counted WORTHY TO ESCAPE the terrifying GREAT TRIBULATION that is soon to strike an unsuspecting Israel! PETRA, an ancient Arab stronghold deep in the rugged mountains, is accessible only by traveling through narrow, twisting gorges on horseback! (Letter, April 15, 1956). We thought of that, when we were in Petra---and how undoubtedly that is the very place where WE shall spend from 3 to 7 years during the Great Tribulation and possibly also the terrible Day of the Lord, soon to come---IF we are close to God instead of this pleasure-man world--- if we are praying always, and WATCHING, and accounted worthy to escape the things that are coming on the earth! (Letter, May 8, 1956). Apparently many are carelessly supposing they are now SURE of being protected through the Great Tribulation (now ALMOST READY TO STRIKE!). Whether it will be Petra or another place, many feel carelessly secure, and, after that, entering God's Kingdom with ETERNAL LIFE! But YOU DON'T HAVE IT "MADE." You are still being TRIED -- to determine whether you shall have this protection -- whether you shall enter the Kingdom of God! It is those who are LED BY the Spirit of God -- NOT those who are led by desire for more and more physical and material things!...SO, hundreds of you are SLACKING OFF in your RESPONSIBILITIES in GOD'S WORK!...SO, hundreds of you are SLACKING OFF in your RESPONSIBILITIES in GOD'S WORK! (Letter, September 1, 1968). Thus, Herbert Armstrong felt that those who slacked off in their responsibilities in doing God's work, would probably not go. He further wrote, "I hope to arrange for the use of Petra as a possible refuge or place of safety during the Great Tribulation, when I see King Hussein." (Letter February 25, 1982). Incidentally, I know many of you seem to have your hearts set on going very soon to Petra as "the place of safety" during the soon-coming Great Tribulation. Well, GET YOUR MINDS OFF PETRA. Brethren, I HAVE NEVER said that Petra definitely is the place of protection where God will take us. I HOPE IT IS NOT! One reason it could be the place is that it is a place NOBODY ELSE WOULD WANT TO GO. It would be the most UNpleasant, UNcomfortable, miserable place you could go! There is nothing to be desired there. But, just in case, God HAS miraculously given me very gracious favor in the eyes of King Hussein and also his brother, the Crown Prince. They are very friendly to me personally (Letter, July 16, 1982). In three specific references, the Bible seems to associate Petra with God's end-time place of protection for His people, but these scriptures are all somewhat vague and can be understood in more than one way. If these verses do not refer to Petra, though, it would seem that God really has not given us any indication of the location where He will nourish His people during the final three-and-a half year period....(Isaiah 42:11-13)...Isaiah 33...verse 10...(v.14)...(vv.14-16)...Another reference is Isaiah 16. Here God tells the Moabites, who rule the area of Sela or Petra (v.1), to shield His outcasts...While the details of how and where God will protect His people are fascinating, we must all keep in mind that in the ultimate sense our protection does not come from any place--it come from God (Ogwyn, John. Is There a Real Place of Safety? Living Church News. July-August 2001; pp.5-6). Send the lamb to the ruler of the land, from Sela to the wilderness, to the mount of the daughter of Zion. For it shall be as a wandering bird thrown out of the nest; So shall the daughters of Moab at the fords of the Arnon. Take counsel, execute judgment; Make your shadow like the night in the middle of the day; Hide the outcasts, Do not betray him who escapes. Let my outcasts dwell with you, O Moab; Be a shelter to them from the face of the spoiler. From these verses, we learn that Moab hides the outcasts, those who escape--this could be God's people as Jesus told them "pray always that you may be counted worthy to escape" (Luke 21:36). We have seen that this place has something to do with Moab, Sela, and the wilderness. We know that some of the area that once was Moab is modern Jordan (while there also used to be Edomites there, we in the COGs tend to feel they moved much further north). We also know that Sela means rock. It is called Petra in Greek, which also means rock. There is a deserted town in Jordan named Petra, which is the place called Sela in Isaiah. 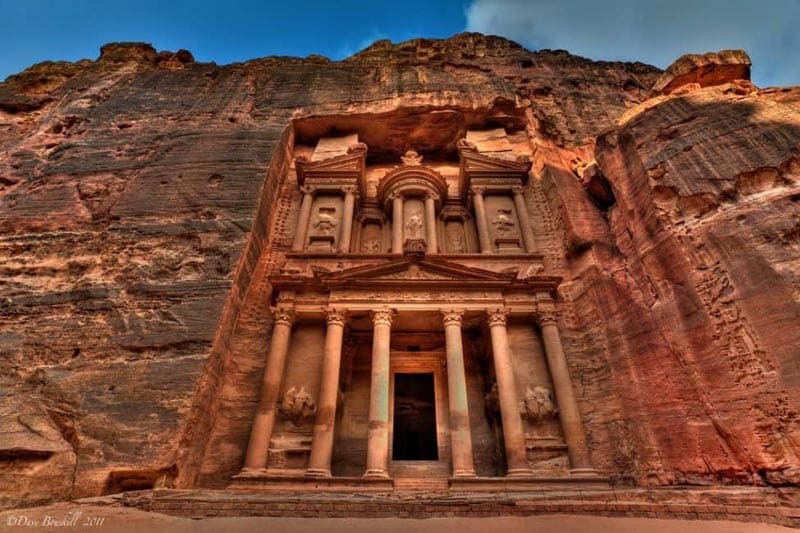 Petra is not a city itself, and is in a lonesome, rocky, desert wilderness that contains caves. It is possible that some other place on Earth also meets these criteria, but thus far Petra appears to be the leading candidate. They will carry away to the Brook of the Willows. For the cry has gone all around the borders of Moab, Its wailing to Eglaim And its wailing to Beer Elim. For the waters of Dimon will be full of blood; Because I will bring more upon Dimon, Lions upon him who escapes from Moab, And on the remnant of the land (Isaiah 15:7-9). It is possible that the term "Brook (Hebrew nachal which indicates a stream, flood, or similar) of Willows" (Hebrew arab') may be a reference to the area near Petra called Wadi al-Arabah (which some claim means something like "valley of the desert" or perhaps "drainage area of willows"). Wadi al-Arabah is also called Wadi al Jayb. As Wadi al-Arabah is about 180 kilometers long, from the southern shore of the Dead Sea to Al Aqabah in the south (hence it is in Jordan, though some of it may be in Israeli territory), it runs past Petra to the west and it is somewhat close enough to Petra to "carry away to ". A Wadi is supposed to be some type of drainage area (or simply a low area or valley that drains when flooded). A small one closest to Petra seems to be Wadi Musa ("valley of Moses")--which is currently not wet--but on a map it looks like it would drain into Wadi al-Arabah if wet enough. But it is possible that since the name Wadi implied a wet area when it was given, that this "Brook of the Willows" includes the area of Petra. But this is uncertain--but again these verses in Isaiah 15, like those in Isaiah 16 do also indicate that perhaps some area in Jordan is involved. You who dwell in Moab, Leave the cities and dwell in the rock, And be like the dove which makes her nest in the sides of the cave's mouth (Jeremiah 48:28). For thus says the LORD: "Behold, one shall fly like an eagle, And spread his wings over Moab..." (Jeremiah 48:40). It should also be noted that Petra is southeast of Jerusalem, which, as we saw earlier, is a possible direction for the place to be. Other than the aspect of caves (which does not mention the amount of caves), it should be noted, that many other areas in Jordan also are in the right direction and fit the description of the place--so it is possible that the Church may flee into Jordan and not stay in Petra, but somewhere else in Jordan. Petra may be the place of safety (Meredith RC. Servant Leadership. Sermon, April 12, 2008). ...the place of safety...Petra...it might be the place (Meredith RC. Prophecy Overview. Sermon, July 19, 2008). The place of safety, in Petra...No we don't say it has to be Petra...Mr. Waterhouse called Petra "the place of final training" (Meredith RC. The Destiny of America and Britain. Sermon, July 24, 2010). The idea that those going to the place will undergo final training is one that we of the Philadelphia remnant of the Church of God embrace. We do not believe that we are simply going to save our physical selves, but to be trained so that we can be more effective servants of God. It may be of interest to note that although Moab (somewhat associated with modern Jordan) is likely to somewhat support the upcoming King of the South (Daniel 11:40), Moab ends up escaping the punishment by the final King of the North (Daniel 11:40-43)--and possibly God allows this escape because the place of protection may be in their land (though the King of the North would likely believe that there are other reasons, including political ones). If you have run with footmen, and they have wearied you, then how can you contend with horses? And if in the land of peace, in which you trusted, they have wearied you, then how will you do in the floodplain of Jordan? For even you brothers, the house of your father, even they have dealt treacherously with you; Yes they have called a multitude after you. Do not believe them, even though they speak smooth words to you" (Jeremiah 12:5-6). The implication to God's people is if you are having a difficult time living in a relatively peaceful land, what will happen to you when you are being pursued by 'a multitude' in the 'floodplain of Jordan'? Remember, the serpent spews out a flood to try to destroy those who flee to the wilderness (Revelation 12:14-15). Thus it is possible that this is why Jeremiah is warning God's people about how they will do in the 'floodplain of Jordan' (most any map suggests this floodplain looks like it is east of Jerusalem, God's people would probably need to cross it if they arrive in Jerusalem and head towards Petra). I have heard the reproach of Moab, And the insults of the people of Ammon, With which they have reproached My people, And made arrogant threats against their borders. Therefore, as I live," Says the LORD of hosts, the God of Israel, "Surely Moab shall be like Sodom, And the people of Ammon like Gomorrah-- Overrun with weeds and saltpits, And a perpetual desolation; The residue of My people shall plunder them, And the remnant of My people shall possess them." This they shall have for their pride, Because they have reproached and made arrogant threats Against the people of the LORD of hosts" (Zephaniah 2:8-10). Right after recording that God told Moab to shelter His outcasts (Isaiah 16:4), Moab's pride (vs. 6) and the fact that Moab would be stricken (vs. 7) are mentioned. These verses appear supportive of the concept that the place is somewhere in Jordan (like Petra) and that all in Moab (modern Jordan) will not like God's people being there. Come, my people, enter your chambers, And shut your doors behind you; Hide yourself, as it were, for a little moment, Until the indignation is past. For behold, the Lord comes out of His place To punish the inhabitants of the earth for their iniquity (Isaiah 26:20-21). Therefore thus says the Lord God: 'Behold, My servants shall eat, But you shall be hungry; Behold, My servants shall drink, But you shall be Thirsty; Behold, My servants shall rejoice, But you shall be ashamed; Behold, My servants shall sing for joy of heart, But you shall cry for sorrow of heart, And wail for grief of spirit (Isaiah 65:13-14). So in spite of the hardships at this place, God's servants shall rejoice at this place. Let the redeemed of the LORD say so, Whom He has redeemed from the hand of the enemy, And gathered out of the lands, From the east and from the west, From the north and from the south. They wandered in the wilderness in a desolate way; They found no city to dwell in. Hungry and thirsty, Their soul fainted in them. Then they cried out to the LORD in their trouble, And He delivered them out of their distresses. And He led them forth by the right way, That they might go to a city for a dwelling place (Psalm 107:2-7 ). These verses may be saying that after being in the wilderness, that possibly God's redeemed may end up dwelling in a city. There is a town near Petra, called Wadi-Musa. Wadi-Musa still is in the wilderness. In biblical times, a town of that size would have been considered a city. Thus it may possibly be a place that Philadelpians will dwell for a short time as for a while they will apparently need to be in caves in Moab (Jeremiah 48:28). And they gathered them together to the place called in Hebrew, Armageddon. Then the seventh angel poured out his bowl into the air, and a loud voice came out of the temple of heaven, from the throne, saying, "It is done!" And there were noises and thunderings and lightnings; and there was a great earthquake, such a mighty and great earthquake as had not occurred since men were on the earth. Now the great city was divided into three parts, and the cities of the nations fell. And great Babylon was remembered before God, to give her the cup of the wine of the fierceness of His wrath. Then every island fled away, and the mountains were not found (Revelation 16:16-20). Therefore it is possible that God will have His protected people flee from Petra when they learn that the armies have gathered together in "the place called in Hebrew, Armageddon". And that they will go to a small city, or perhaps in tents outside some small city. I will set a sign among them; and those among them who escape I will send to the nations: to Tarshish and Pul and Lud, who draw the bow, and Tubal and Javan, to the coastlands afar off who have not heard My fame nor seen My glory. And they shall declare My glory among the Gentiles (Isaiah 66:19). Doesn't this sound like those that go to this place will preach the Gospel once they leave it? Is it not then logical that those that were allowed to escape and go to this place were those that placed their top emphasis on getting the Gospel out prior to escaping? It thus seems that perhaps the reason that the Philadelphians are protected is because they are currently doing the work, will do a type of work in the place of safety (even a Catholic prophecy calls those in the place a "the advanced guard"--which essentially seems to imply that they will be someone getting out the message that Jesus will return to establish His millennial kingdom) , and will be used of God to do another proclamation work after the place of safety (yes, that would be after I Thessalonians 4:16). Jesus said, "Watch therefore, for you do not know what hour your Lord is coming...Blessed is that servant whom his master, when he comes, will find so doing" (Matthew 24:42,46). He also said, "Take heed, watch and pray; for you do not know when the time is" (Mark 13:33). Son of man, when a land sins against Me by persistent unfaithfulness, I will stretch out My hand against it; I will cut off its supply of bread, send famine on it, and cut off man and beast from it. Though these three men, Noah, Daniel, and Job, were in it, they would deliver only themselves by their righteousness, says the LORD God...they would deliver neither sons nor daughters; only they would be delivered, and the land would be desolate (Ezekiel 14:13-14,16). Thus depending on others will not save you. That is why Paul says in Philippians, "work out your own salvation with fear and trembling" (2:12). The remnant of the Philadlephia remnant of the Church of God believes the '18 restored truths' and places their priority on publicly proclaiming the Gospel of the Kingdom, it seems that its members make up the bulk of the remnant of the Philadelphia era of the Church (for more information, please read What is a True Philadelphian?). However, just being in any Philadelphia-leaning COG group is not a ticket to the place of safety. However remember that God's people are to be gathered together "Before the decree is issued...Before the day of the LORD's fierce anger" (Zephaniah 2:1-2), thus the Church will probably be the instrument that issues the decree to flee! We are living during the Laodicean era of God's Church. That means that of all the truly converted Christians most are Laodicean (which is why only the remnant of the Philadelphia era would be around today). And the Laodiceans are not only confined to groups other than Living. That means that you could be one. I could be one. Any of us could be Laodicean. And if so, we need to make some big changes. Otherwise, God will resort to drastic measures--putting us through the worst trial in human history. So what are we now to do, individually, to be delivered and to avoid the consequences of the Great Tribulation? We are to pray that we will be accounted worthy (Matthew 24:20); to ask God to help us repent now so we won't need to be severely chasten during the Tribulation later. We need to pray that our flight will not be on the Sabbath or in the winter (Luke 21:36). We need to watch. Watch world events (Matthew 24:20, Mark 13:33) and our own lives (Luke 21:36). And take heed that no one deceives us! (Matthew 24:4)--in today's "attend the COG of your choice" environment being at least partially deceived is easier than before (here is an article titled Unity: Which Church of God for You?). The Laodiceans...will not be taken to the place of safety...Don't be a Laodicean...Put your heart in your prayers...Put your heart in the work of God (Meredith RC. Prophecy Overview. Sermon, July 19, 2008). The Philadelphians have God's " command to persevere" (Rev 3:10) and are told to “hold fast to what you have, that no man may take your crown” (v.11). Perhaps this is a warning not to be swayed by doctrinal changes contrary to our core, fundamental beliefs, which are instituted by men, irrespective of their position or education. We are told to be “so doing” when Jesus returns (Matthew 24:46). We need to have works of which God approves (Revelation 3:8). We must be hot--not lukewarm (v.15). What About other COG Groups? There are heretical leaders who have misled true Christians what they are to hold fast to. I feel that most of the true COG leaders that are not basically supporting the two criteria that I believe the Bible, as well as clearly Herbert W. Armstrong, set for the Philadelphia portion of the Church are men whose actions are contributing to the taking of crowns of those that could be Philadelphian. Many also contribute to diluting the efforts to get the gospel to the world as a witness. And that is part of the reason why the COGwriter website has articles on two dozen Church of God of the scores of such groups (those articles can be found at the COGwriter home page). The Book of Revelation shows that there will parts of four Churches of God at the time of the end (Thyatira, Sardis, Philadelphia, and Laodicea) and I believe that those that are actually part of the Church of God, but are not actually Philadelphian are almost all in the Thyatira, Sardis, and/or Laodicea churches. Thyatira...I will kill her children with death, and all the churches shall know that I am He who searches the minds and hearts (Revelation 2:18,23). Sardis...Therefore if you will not watch, I will come upon you as a thief, and you will not know what hour I will come upon you (Revelation 3:1,3). Laodiceans... As many as I love, I rebuke and chasten. Therefore be zealous and repent (Revelation 3:14,19). Philadelphia...Because you have kept My command to persevere, I also will keep you from the hour of trial which shall come upon the whole world, to test those who dwell on the earth (Revelation 3:7,10). While it is possible that some in the Thyatira, Sardis, and/or Laodicea churches may repent, only the Philadelphians are promised protection from the great tribulation, "the hour of trial". And that is another reason that understanding church eras is important. Who Goes to a Place of Protection? Those in the true Body of Christ shall be protected until this tribulation will be over (Rev. 3:10-11)--applying to those faithful in God's Work now going to the world. Rev 12:14; U.S.A. 26:20. But YOU must make your own decision -- and to neglect doing so is to have made the wrong decision! God isn't kidding! This is for real!...The decision is now yours! (Armstrong, Herbert W. The United States and British Commonwealth in Prophecy. 1975; p:60). And of course he was right--the decision is yours. We all need to heed God's warning to the Laodiceans--"He who has an ear, let him hear what the Spirit says to the churches" (Revelation 3:22). To these elect, Christ said, “FEAR NOT, little flock; for it is your fathers good pleasure to give you the kingdom” (Luke 12:32). He promised that this elect would always be on earth. The end-time remnant of that group would have special strength to preach Christ’s Gospel to all the world for a witness (Matt. 24:14). You need to find out where that Work is being carried on! Why? Because it is only those having a part in that Work who have any guarantee of safety. Others may survive after years of ordeal and pain, but the path of the elect is safe and sure. To this end-time “elect” doing God’s Work, Jesus says, “I know your works” behold I set before thee an open door” (Rev. 3:8). This door refers to a way being opened to preach the Gospel (II Cor. 2:12). Today, that way is through the mass media of radio, television, the printing press, and personal evangelism. “And…no man can shut it: for thou hast [only] a little strength, and hast kept my word, and hast not denied my name” (Rev. 3:8). The very elect would NEVER become corrupted by false doctrines, or be muzzled by boards of men—they would never deny Christ’s name or His doctrines! Believe it or not, that group exists! The “elect” are on the earth at this moment, doing God’s work. A way of escape is available and attainable to YOU! And in the 21st century, that would be the real remnant of the Philadelphia portion of the Church of God. God will set before us an open door and no man can shut it. God can shut it, and He will when the work is finished and the Philadelphia Church has gone to the place of safety...Philadelphia has little strength to do this great work which God has given it to do...It is the Church of Laodicea who had no vital part in the work of God today even though they live today and are part of the generation which will see Christ return (What is the Laodicean Church? Good News, August 1959, p.12). I believe that the Bible clearly teaches that the remnant of the Philadelphia era of the Church will go to the place of safety. My position is that Petra may be the place, but if it (or some similar area in Jordan) is not the place, then the Bible is simply not specific enough to any other particular location for us to know. Those who assert that Petra is not the place (or near the place), seem, to me at least, to be asserting a questionable position at best. Watch therefore, and pray always that you may be counted worthy to escape all these things that will come to pass, and to stand before the Son of Man (Luke 21:36). Only those supporting the true Philadelphia-work of the Church of God and who are truly Philadelphians will be protected in that place. we all need to pray always and "grow in the grace and knowledge of our Lord and Savior Jesus Christ" (2 Peter 3:18) so that we may be accounted worthy to be there. Is There A Secret Rapture for the Church? Will Jesus' return be a secret? What does the Bible really teach? The Ephesus Church Era predominant from 31 A.D. to circa 135 A.D. The Smyrna Church Era predominant circa 135 A.D. to circa 450 A.D. The Pergamos Church Era predominant circa 450 A.D. to circa 1050 A.D. The Thyatira Church Era predominant circa 1050 A.D. to circa 1585 A.D. The Sardis Church Era predominant circa 1585 A.D. to circa 1933 A.D. The Philadelphia Church Era predominant circa 1933 A.D. to 1986 A.D.